I need help with the Feb Discount Coupon for on-line orders. It's not working correctly for multiple items. Tried using the coupon code when ordering online, but received a "Coupon Expired" message on my order form. Double checked the email and it said it expired 3/31, so I thought it would be good through today. Did i just read that the wrong way, or should it still work until midnight tonight? Its been awhile back that I got my first LM order but I am now getting around to asking this. Several papers come with the package but on the one paper that lists everything I got, it says to add my customer ID with my next order, is it just that the LM staff wants to keep track of its customers or would I get a discount of some sort on my next order? If so then what kind of discount. Thanks. No special discount. When you make your next order, your info should have been saved in your account anyway, if you order online. We have specials and discounts year round and monthly. For the month of May we have 10% off "Mother's Concerns" items. Anything to do with the family and home. You receive the special discount code from our monthly newsletter via email which you can sign up for upon placing an order and submitting your email info to us with your order. We also have specials that are available anytime. 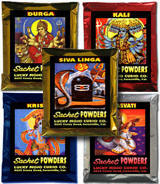 Such as out 12 Oil Special, 12 Sachet Special, 12 Bath Crystal Special, 12 Incense Powder Special, and 6 Herb Special. 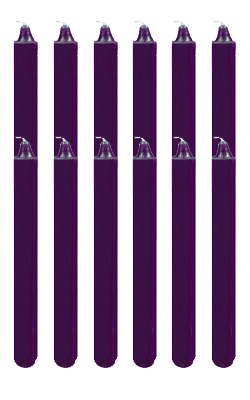 Along with discounts for buying dozens of 4", 6", and 9" Jumbo Candles. Thanks for letting us know about any and all such problems. We will honour any properly dated coupon if it is within the period of its freshness, even if you have technical problems. 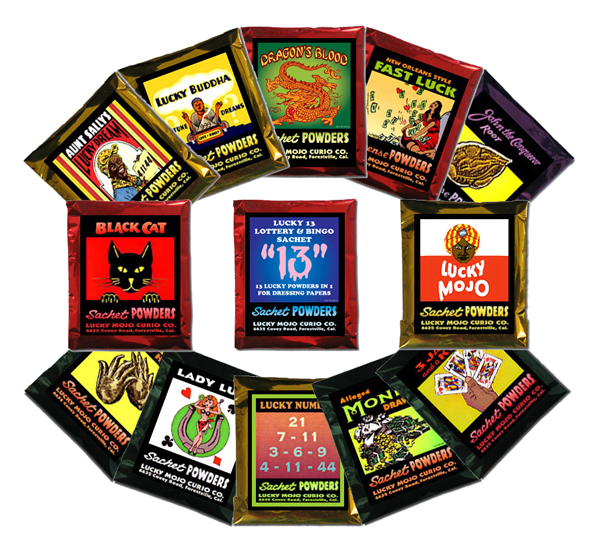 After placing your order, call the Lucky Mojo shop and let them know of your problem and who you are so that they can be sure that your coupon will be redeemed accurately: 1 707 887 1521. Post here if you have additional problems which aren't described here. Thank you! 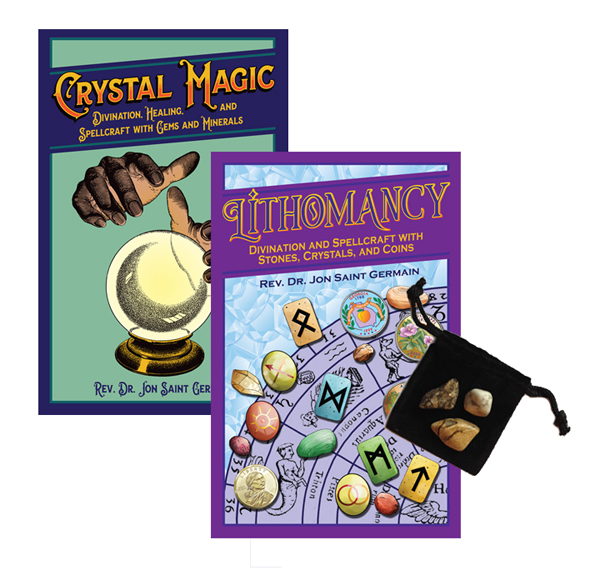 Dr. Dume is right -- there are regular specials for bulk purchases (dozens, and such) and "special specials" -- watch your monthly newsletter for the 20% discount coupons on selected items. I have a question about the 12 oil special for $66.00. I know I need to put that in the message are the checkout cart, but do you adjust the price later? How does that work? 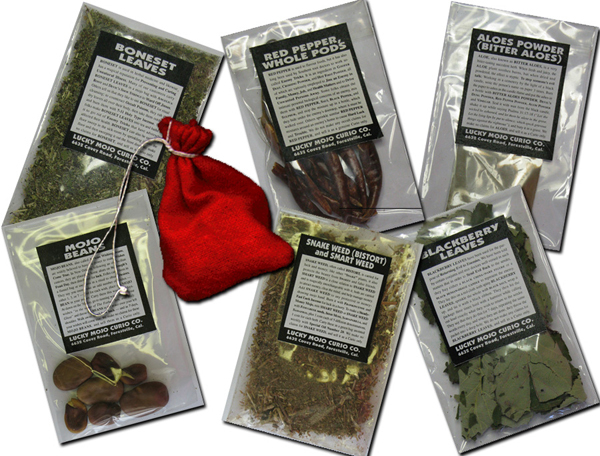 Order the 12 oil special, then specify which oils you want in the message section. 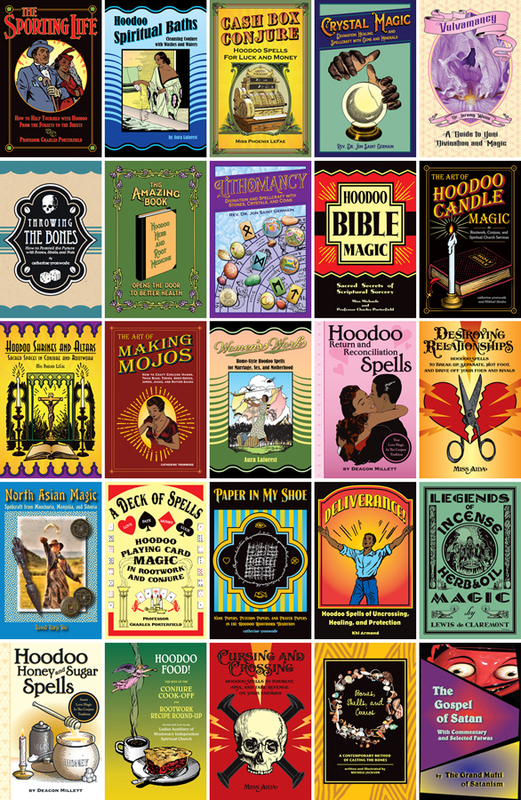 They have to be the same type of oils, such as hoodoo condition oils, catholic saint oils, zodiac oils, etc. You are saving $6 by ordering 12 oils, as this quantity would normally cost $72. If someone does not order 12 oils total or if they order oils from two or more categories, we will contact via telephone or email to straighten the order out before processing. We take the discount when we actually check out and write up the order -- the order is not auto-processed, as at Amazon. 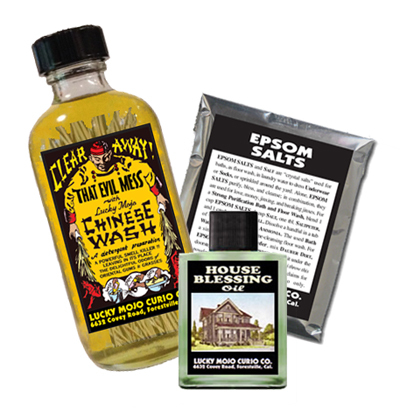 I was listening to the radio show on Sunday, and I thought I heart something to the effect that King Solomon Wisdom products were discounted for this month, but they appear to be the same price on the site. Am I mistaken? Did I hear wrong? Thanks! The code for the discount is in the monthly newsletter. Every month the newletter contains a code for a different product. I just found it. (Apparently, the reason I did not see it in my copy of the newsletter was because, for some reason, Gmail clipped off the part at the very end where the coupon is located.) Thanks! My gmail did the same thing..which is odd, because it never did that before. I didnt see one in the one (discount code) for april 2014. maybe its my computer? also there was no free spell. i clicked on the master free spell mentioned in the newspaper and it kept taking me back to the master oil site which mentions no free spell. Sarafina wrote: I didnt see one in the one (discount code) for april 2014. maybe its my computer? in each instance of the link, image, and descriptive purpose. it may be just you. good luck!! hello nagasiva, i just clicked your link and there isnt a free spell. did i also miss the discount? Try going to the Lucky Mojo facebook page and try to link the newsletter from there. Rather than a step by step spell this month, there's complete information on how to use Master products most effectively. I have found a four-fold ritual, increasing in intensity, works well with Master, Power, and my fave Master Key. For the first week, wake before dawn and light a Master vigil candle or purple candle anointed with Master Oil. For the second week, add the reading of Psalms 47 to the candle ritual. 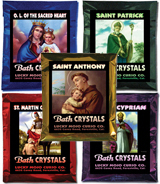 For the third week, add Master Bath Crystals to your bath, reading Psalms 47 over it. Bathe by the light of the Master candle. For the fourth week, add Master Incense and air dry in the smoke. This ritual can be used with any intention where Mastery is the desired result -- learning to play the guitar, a practical exam in biology, gaining a promotion at work. Deacon, that's elegant -- a gradually unfolding ritual is just the thing for someone who has yet to achieve mastery. Sorry -- when nagasiva and Miss Phoenix wrote and uploaded the April 2014 newsletter, they did not ask me to write a free spell for the Master Spiritual Supplies page -- so it did not get done. I did it this morning, when i saw this note, and it is on the page now! My apologies to all. -- and, depending on what browser you use or how recently you visited the page, you may have to REFRESH the page for it to show. Verily God hath heard me; he hath attended to the voice of my prayer. A wonderful spell, Miss Cat...very similar to how you told me to use my first whole Master Root! just saw this. thank you miss cat!! I still can't see it... I can see lots of things but no spell, I tried to refresh as well. Don't know what to tell you. I just clicked on to the link that Miss cat posted and it's there. Maybe try from another computer?? I just signed up for the newsletters. Has the May 2014 newsletter come out yet? If I didn't receive it, can I? Also, if not, when will it be coming out? Thanks. Check out the Newsletter archive and see if it has been added yet. You can also go to the Lucky Mojo Facebook Page and Like the page while you are visiting. That page will contain all the most recent activities, including notices of newsletter publishing, which should be making their way into the archive very soon). Last edited by nagasiva on Mon Sep 29, 2014 4:10 pm, edited 2 times in total. I'm about to purchase 12 separate oils which will total $84.00 ($7.00 each) but with the discount it will total $66.00 plus shipping. The cart reflects $97.00 including shipping at checkout. Even though the cart says $97.00 since the discount is not auto processed, my card will only be charged $66.00 plus shipping at processing. Do I have this correctly? If you selected all 12 oils from one category -- that is all OIL-HOO -xxxx or OIL-ESS-xxxx or OIL-ZOD-xxxx -- your total will be $77.00, not $66.00. (One oil is free). The price of $66.00 for 12 oils you saw above is a discount price we have not used since mid 2012. When that last post was made, our oils were $6.00 per bottle, as in the mention above, from 2012. Since May 2012, our oils have been $7.00 per bottle. Also, if you cross categories and try to take a discount (say 11 from OIL-HOO-xxxx and 1 from OIL-CAT-xxxx) we will call and/or email you to try to resolve the problem. If you are not available or do not respond, you will be charged fuil price with no discount, since the two categories cannot be combined. But if all 12 oils are in the sane category, and if you live in the USA, you will indeed be charged for $77.00 for 11 oils (one oil will be free), plus shipping -- in this case, $13.00 shipping -- for a grand total of $90.00. This forum is dynamic and cumulative, and old posts do not reflect current prices. The price STRUCTURE is correct, though -- 12 oils for the price of 11. Hi, yesterday I just received January's newsletter, and it seems to me its very much meant to be January's instead of February's, since it has the relevant info and discount code and all, but I never got one for February? I have definitely been making sure to confirm my e-mail every month, and I've double-checked my spam folder to make sure it didn't get hidden away in there. Just curious is all. Thank you for your time! I got the same newsletter. I think it's a misprint and they meant February. On February 27th, I received a newsletter in my inbox dated January 1st. Is this the correct newsletter? The coupon at the bottom even says it expires 1/31/2015. Where can I go to read the March edition? It looks like they made a mistake. We all got the same one. Please call the shop about the coupon if you wish to use that particular one. I have a question. Is there a particular day the newsletters are sent out? or is there a wait period before you begin receiving them? I signed up for the Newsletters on September 16 2015 and haven't received anything. Are the letters still active? Any help with the matter would be greatly appreciated! The newsletters are indeed still active. They are typically sent out at the beginning of each month but I have not seen one for October yet. You could contact the Lucky Mojo shop to ask specifically about your circumstances as we have no way of knowing whether you are on the list as an active subscriber yet. Newsletters still going out? The link to sign up for it doesn't work... Hmmm. My next order have one bottle of 4 oz. Rootworkers & Churches Special Oil and some incense,i just received the Coupons todays,can i have access to a 20% on this order ? This would be a good question to contact the store with. They may be able to apply the coupon or they may not, depending on how far they are in putting your order together. The OCTOBER 2016 Lucky Mojo Curio Co. Newsletter is out. 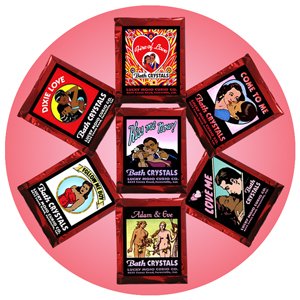 Several interesting articles are included -- on the new LMC Radio Network show "Fit and Foxy" starring Madame Nadia, Susan Barnes, and Jaiye Dania; the history and popularity of j-setting in Black, gay club culture; and an in-depth look at the veneration of Black Hawk among hoodoo Spiritualists -- plus, there links to product information and free spells. All of this makes for a special edition, so check it out. By the way, if you do not subscribe, you will not see the discount coupons each month via email -- so here is a link to get you to the archived version of the newsletter. Pick up your coupon -- and subscribe! We have had trouble hiring someone to write our monthly newsletter. Without the newsletter, no discount codes. I am sorry -- but i cannot do more than i have time for, and the monthly newsletter and discounts has long been the work of someone else. We are trying to find someone.... Stay tuned. If I buy 12 oils as follows (plus some other stuff), how much will i pay for the oils alone? Because you have asked me in another thread to use powders for some of the stuff I intended using the oils for, I think i will get 3 powders instead and drop 3 oils. So, is there a set of 6,8 or 9 oils or thereabout with discount? The discounts for oils are only for 12. 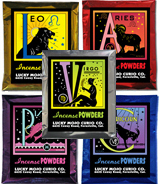 There is also a discount for 12 powders, 12 incenses, and 12 bath crystals, and these come in the Hoodoo, Hindu, Catholic, Zodiacal, Essential/Fragrance, and Planetary lines. That is a total of 24 different discount deals for those products that we make. and the ever-popular Churches and Rootworkers Special on 4 oz. bottles of oil. So ... that's all the Discount Specials that I recall off the top of my head. Plus, if you subscribe to our email newsletter, you can order the Monthly Special on one product line at a 20% discount that month only. We also hold a free product giveaway every Friday. An announcement about the giveaway is made each Friday in this Forum, and each week a link is provided to guide you to the Lucky Mojo Facebook page, where you may enter that week's contest.